14 April 2019: At Sea Day 1. We are now on our way to Al Aqabah which is a five day sea voyage up the Gulf of Aden and then into the Red Sea. Eventually I hope to report if the Red Sea is indeed red or if there is something different going on (Or was going on, when they came up with the name). But that will take a while as of lunch time today it was still 500 miles to the Bab El Mandab rock formation which forms the official entrance to the Red Sea coming from the south. We are sailing at a considerable distance away from the shore line, to stay in international waters but also to stay away from fishing boats and other mayhem which tends to congregate on the edge of the deep water to shallow water. That is where the fish tends to come to the surface and might swim straight into the nets. I am spending my days writing power points for the Safety Officer which is the training officer on board, as for some reason a necessary variation in lesson materials was forgotten when the ship came into service. Maybe because it is not compulsory under the Maritime Law. The Law says the crew shall be trained but not how that shall be done only that the stipulated minimum requirements shall be fulfilled. But training gets very boring if you present the same presentation every week; So i let my creativity flow. This is an extraction maneuver where we remove a casualty from narrow location while staying behind the safety of the fire curtain. The teams are not in fire gear as it was too warm and this was about techniques. Not a drill attack. The guy in the white coverall is the team leader. He has two nozzle-men in front of him keeping up the water screen and he just directed one crew member forward to slowly inch the casualty into the protecting water screen. From there a stretcher team can do the rest. In a real situation they would all be in protective gear and with Scuba. 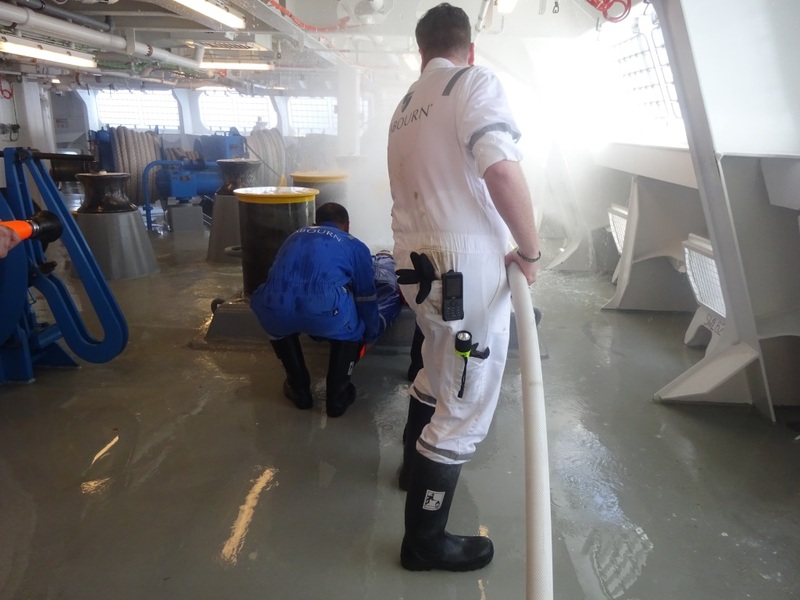 Then I also take the chance to conduct some practical firefighting training on the aft mooring deck. We cannot do that in port because A. the ropes are in the way, and B. there is always some wise guy on the dock who thinks that the water coming over the side is polluting the harbor. The fire hose water comes from the Main Fire Line which pumps directly out of the local harbor, so polluting is not possible but shore side might not know that. But the Chief Engineer is concerned that what is pumped out of the harbor might block his fire pump and that is an emergency tool. So we do it at sea and the main purpose is to refresh memories. All our crew goes to firefighting training on a regular basis, but to use a quote: you will still remember how to ride the bike, but you might have forgotten of how to win the Yellow Jersey. And with our drills we go for the Yellow Jersey every time and thus we refresh our routines. Meet and Greet upon return of the shore excursion tours. The concrete walls are there to guide the guests to the gangway and not to wander to the edge of the dock. Outside of all these exciting things I have time to observe some staple activities which are part of the Seabourn product. So last night we had the Meet & Greet for the returning Tour Guests. 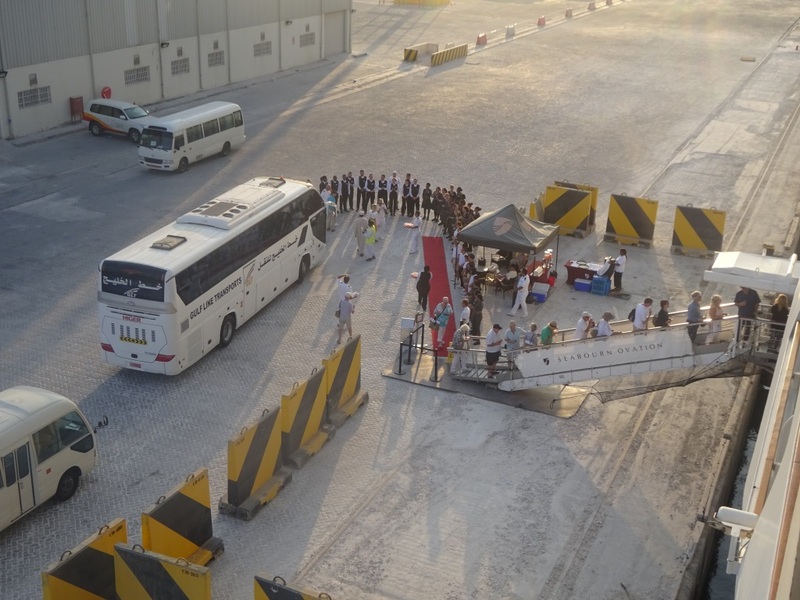 The ship does this if the tour buses are allowed to come straight back to the ships gangway. Last night that worked and a sizable number of crew lined up. With Refreshments and Music. Dancing under the Stars during the Arabian Night. Some people have all the luck in the world. 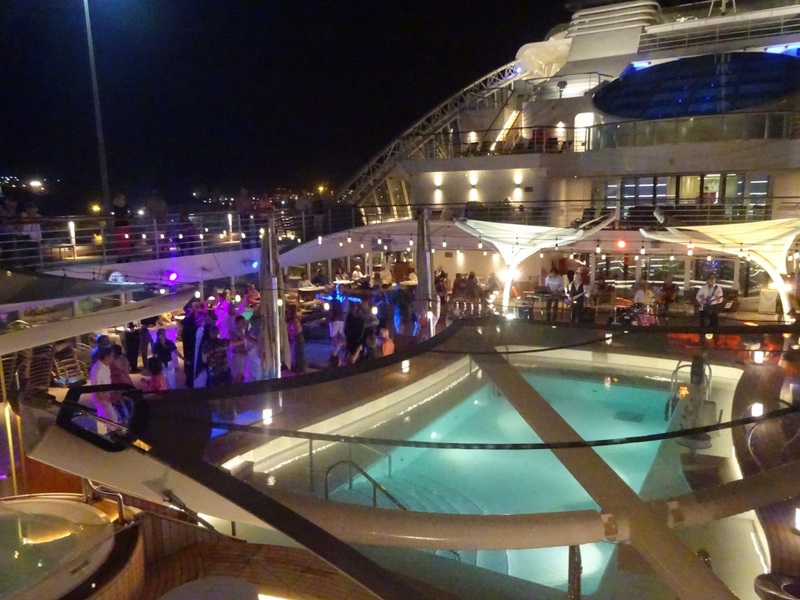 Then in the evening there was the Deck party, called Arabian Nights, located at the Patio, that is the sheltered area (on the sides, the top is open) around the amidships swimming pool. It took me right back to the Holland America Line days of World Cruising. About half the guests had bought some sort local costume and wore it for the whole evening. Some Ladies had modified the costumes to a certain extent, and that extent would have been frowned upon shore side and/or sent the local police into certain frenzy. But the results were very stylish and nice to look at. The ships hostess could have stepped directly out of a Thousand and One Night fairy tale as a belly dancer. Unfortunately I have to work so I could not stay all night. Maybe a good thing as well as most alcohol is included and the waiters are not stingy with serving. 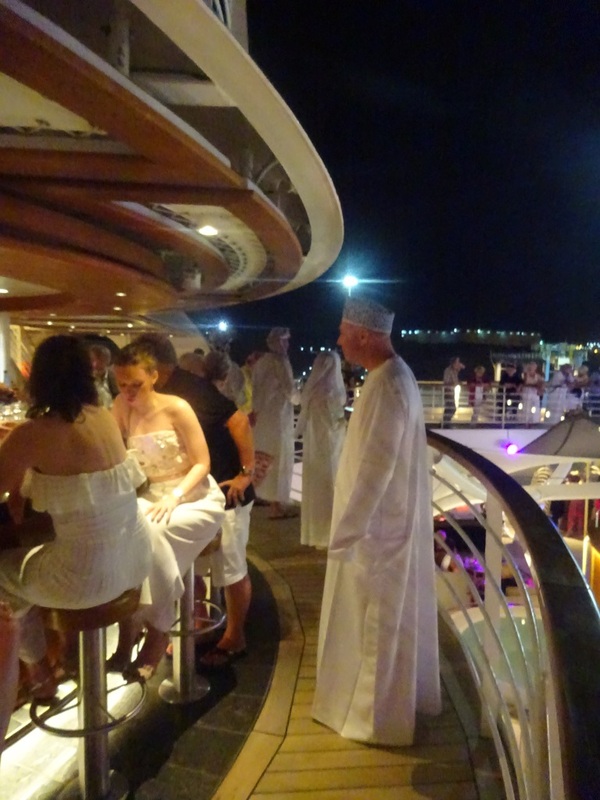 I saw a few guests who eventually had a hard time keeping their turban straight. I like this all inclusive (except the very premium stuff) concept; you do not need a Bar List (the Bar tenders know every cocktail there is) and once they know your preferred drink, it shows up at once and it keeps coming every time your glass is empty. (And there goes the Turban…………….) Holland America is also experimenting with this option, as part of some cruise packages. And we are closely watching how the response will be as it something fairly new for the Holland America Crowd. Today is a quiet day with lectures, demonstrations and other regular routines. In the Colonnades (that is the Lido in HAL speak) it was Mexican day. And although the Exe. Chef is from England he made a mean fajita. Not good for the diet. For the time being we will continue our voyage in the Gulf of Oman although we just passed the border with Yemen. There is nothing insight except the occasional tanker. And the weather is still the same. Partly Cloudy with hardly any wind. And Very warm. 13 April 2019: Salalah, Oman. 15 April 2019; At Sea, Day 2. I traveled on Seabourn to Alaska and out of my 5 trips to Alaska this was definitely the best. I asked about the included liquor and the head chap told me that they push less quantity of liquor than the ships where you pay for every drink! I was astounded at that. I must say it is so nice not getting pages of charges when you are getting ready to depart! I so enjoyed your absolutely fantastic blogs on the Suez and area. Especially Petra. I felt like I was traveling along with you. Great Blog and wonderful pictures you send. Keep up the great work. Interesting post. Great fun to read….lots of interesting things. Lots of people on HAL forums are wishing for all inclusive drinks. Many complain that HAL does not offer this. Good to hear there is some testing of this concept occurring. Love to read these posts! 20 April 2019: Gulf of Suez. 19 April 2019: Al Aqabah, Jordan. 18 April 2019: At Sea, Day 04. 17 April 2019; At Sea; Day 03.